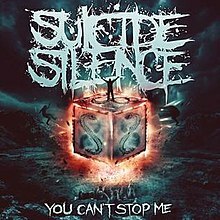 You Can't Stop Me is the fourth studio album by American deathcore band Suicide Silence. It was released on July 14, 2014, by Nuclear Blast. It is the first album with the vocalist Hernan "Eddie" Hermida, and the first album without original lead vocalist Mitch Lucker, who died in 2012. The album title and title track come from a set of lyrics that Mitch Lucker wrote before he died. The song's music video was released on July 1, 2014. On May 6, 2014, the song "Cease to Exist" was released as the first single from the album, and was made available for purchase on iTunes. The lyric video to "Cease to Exist" was released on Nuclear Blast's YouTube channel the same day. The second single from the album, "Don't Die", was released on June 12, 2014. All lyrics written by Hernan "Eddie" Hermida, except "You Can't Stop Me" and "Ending Is the Beginning" by Mitch Lucker; all music composed by Suicide Silence. ^ Kielty, Martin (January 5, 2014). "Suicide Silence detail You Can't Stop Me". Metal Hammer. Retrieved May 1, 2014. ^ "Suicide Silence: 'You Can't Stop Me' Cover Artwork, Track Listing Revealed". Blabbermouth.net. April 30, 2014. Retrieved May 1, 2014. ^ a b Chichester, Sammi (April 30, 2014). "Suicide Silence Reveal New Album Artwork and Details for You Can't Stop Me". Revolver. Retrieved May 1, 2014. ^ "iTunes - Music - Cease to Exist - Single by Suicide Silence". iTunes. Apple Inc. Retrieved May 5, 2014. ^ "Suicide Silence To Debut New Track "Cease To Exist" Next Week". Theprp. May 3, 2014. Retrieved May 5, 2014. ^ "iTunes - Music - Don't Die - Single by Suicide Silence". iTunes. Apple Inc. Retrieved June 11, 2014. ^ Kapper, Andrew. "Suicide Silence - You Can't Stop Me Review". About.com. Retrieved July 16, 2014. ^ Jurek, Thom. "AllMusic Review". AllMusic. Retrieved August 2, 2014. ^ Bowar, Chad (July 15, 2016). "Suicide Silence, 'You Can't Stop Me' - Album Review". Loudwire. Retrieved July 16, 2014. ^ Pasbani, Robert (April 30, 2014). "SUICIDE SILENCE Reveal You Can't Stop Me Album Art & Tracklisting". Metal Injection. Retrieved May 1, 2014. ^ "SUICIDE SILENCE To Release 'You Can't Stop Me' Album In July". Blabbermouth.net. Retrieved May 7, 2014. ^ "'You Can't Stop Me' Title Track Music Video". Suicide Silence. Retrieved July 1, 2014. ^ Hartmann, Graham (April 30, 2014). "Suicide Silence Share 'You Can't Stop Me' Art + Track Listing". Loudwire. Retrieved May 1, 2014. This page was last edited on 14 December 2018, at 05:50 (UTC).